1 of 3 Heat oven to 400 degrees F. In bowl, mix half-and-half, eggs and 1/4 teaspoon each salt and black pepper. 2 of 3 Fit crust into 9-inch pie plate; flute edges. Cut asparagus in thirds. 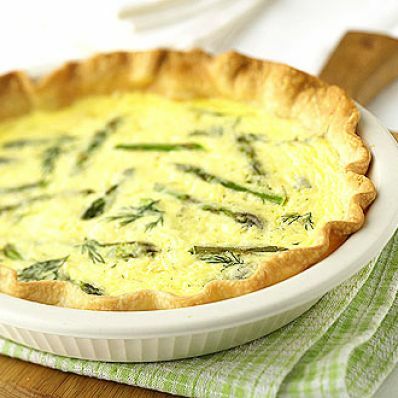 Brush 1 tablespoon egg mixture over crust; top with asparagus and cheese. Pour remaining egg mixture into crust. 3 of 3 Bake on lower rack at 400 degrees F for 25 minutes. Let cool 5 minutes; serve. Per Serving: 1 g fiber, 392 mg sodium, 11 g sat. fat, 143 mg chol., 11 g pro., 317 kcal cal., 21 g Fat, total, 21 g carb.